Are up a breakfast person? I am in love with breakfast and even cook breakfast for dinner. How about you, ever have pancakes at 7:00 pm? One of my favorite go-to meals for breakfast, and sometimes dinners, is oatmeal with apples, cranberries, and cinnamon. I even have a special bowl just for my oatmeal which I think that may make me an oatmeal snob! If you are like me, you don’t always have time to make a bowl of oatmeal in the morning but still want all those flavors. 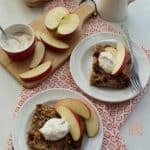 This Baked Oatmeal with Applesauce has become the perfect morning meal, brunch, and even a snack. To be honest, I had never heard of baked oatmeal until I went to my favorite bakery in Santa Rosa, CA called Criminal Baking Co. and Noshery, and in their case of beautiful pastries, they had slices of baked oatmeal. What? Baked oatmeal? Never had it, but it looked like a piece of cake, so obviously I was all in. But after some serious interrogation, I learned the secret to their baked oatmeal, and ordered a slice, warmed up and served with lemon curd, it was so goooood! If you are ever in Santa Rosa make sure you visit Criminal Baking. It’s off the beaten path, down a little side street, seats about 12 and serves some amazing pastries. Until you make it to Santa Rosa, you have this baked oatmeal recipe! If you like oatmeal then you are going to love this. The best part is you can make a big batch and have extra to eat throughout the week. This oatmeal contains all the ingredients I would put in my bowl of creamy oatmeal: oatmeal (of course), apples, brown sugar, cranberries, pecans, cinnamon, and milk, plus I added an egg, butter, and baking powder. I still needed something more to bind the oatmeal and give it moisture, so instead of apple chunks, I put in applesauce. That’s it! You can use jarred applesauce but I just cut up an apple and add some apple juice or orange juice and cook the apples until they are tender, and puree then mash them up. This is how simple this recipe is. Just mix all your ingredients in one bowl and pour in an 8″ x 8″ baking dish. Bake for 30 minutes and you will have a lovely dish of golden brown, moist and tender Baked Oatmeal. A slice of this keeps me filled up all morning. Mmm, my kitchen is smelling so good right now. Let the oatmeal cool just a bit and then serve it warm. You can keep it plain or add your favorite toppings. Today I’m topping mine with cinnamon Greek yogurt and maple syrup with a side of sliced apples. This baked oatmeal is comfort food on a plate. Filled with applesauce and your favorite fruit this is perfect for breakfast or anytime you need a filling snack. In another bowl mix together the applesauce, milk, melted butter and beaten egg. Add the wet ingredients to the dry ingredients, mix to combine. Pour into an 8 x 8" pan, sprayed with cookie spray. Want to join me for breakfast? I’ll go grab you a plate. This made a perfect breakfast this morning with a hot cup of tea and a morning full of sunshine. Check out my post on how I make my morning oatmeal, Creamy Spiced Apple Cinnamon Oatmeal. If you click over you can see my special oatmeal bowl. Next time I bake this oatmeal I am doubling the recipe and using a 13 x 9 pan. Hubby thought this was incredible and had it for supper too. Are you a pinner? I made you a pin to add to your favorite boards. The great thing about this recipe is it is fast and easy. I am definitely making this on the weekend! Yum yum yum! It’s Sunday morning and I just made another dish of this oatmeal. We love it.